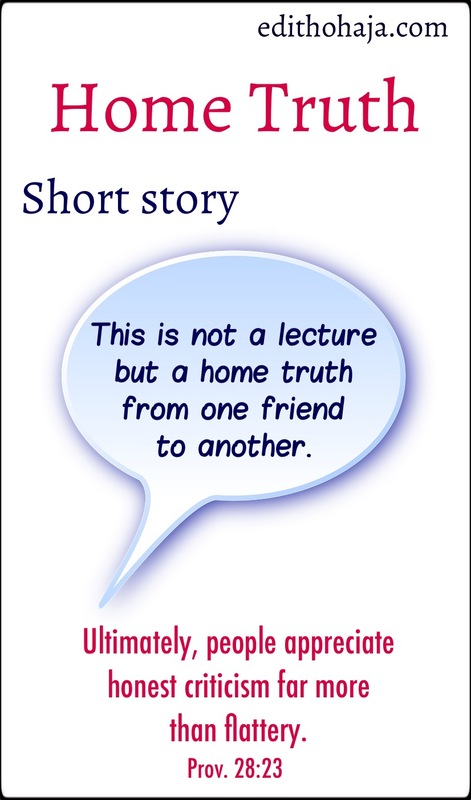 This is a hilarious but instructive tale of ego, church politics and friendship. Read, give your impressions and kindly share on various fora for the benefit of others. You are blessed! Allwell dived for his phone as it began to ring. Unfortunately, it wasn’t the call he was expecting. Rather, it was a programmed promotional message from the service provider. “Lijue nsi onu!” (Eat a mouthful of sh#t! ), he barked, as though the speaker could hear him and threw the phone on the sofa. Anxiety was wearing him out because his self-imposed exile from church didn’t seem to be having the anticipated effect. He had taken offence after an argument with a junior deacon during the workers’ meeting a fortnight ago and had stayed away from church hoping the pastor will contact him to apologise for not calling the younger man to order when he challenged him. As time passed and the pastor didn’t call, he decided that he would make do with a conciliatory gesture from any senior member of the board of deacons. But if anyone had noticed his absence, they were yet to show it. Another ringing of the phone startled him but he chose to ignore it rather than break the device, which is what he knew he would do if he was accosted with another pre-recorded hogwash from the telecom company. As he was walking into the bedroom, he heard a pounding on the front door. It transpired that a brother from the church, Akachi, was there to see him. He would have said, “About time!” but Akachi didn’t count. He was just an ordinary member without a title. “Service was great but I was worried I’ve not seen you for a while. I hope you are ok,” the conversation continued as they sat down in the living room. But who was he kidding? Akachi was a close friend, so he came out with it and the bitterness that had been piling up seeped through. He sowed the highest seeds, paid the fattest tithe and personally supported the pastor’s family; yet he and the older deacons sat by and watched an upstart have a face-off with him. Akachi started his response by complimenting him on his financial contributions to the church and disclosed that he had a confession to make in that regard. “I don’t believe you. A Grade Level 14 officer!” But Akachi nodded his insistence. “My brother, you have a problem!” Allwell exclaimed. “Na you sabi,” Akachi threw back as he headed to the backyard from where the aroma of the jollof rice Allwell’s wife was cooking was wafting. But deep inside he acknowledged that Allwell had a point and resolved that he would double his offering for a start. Hi! Love to chat with you. Do you have a friend or friends who frankly talk to you about your flaws and mistakes? Would love to know how their words have touched your life. Perhaps also, you’re such a friend to someone. Tell us how your words have influenced him or her. 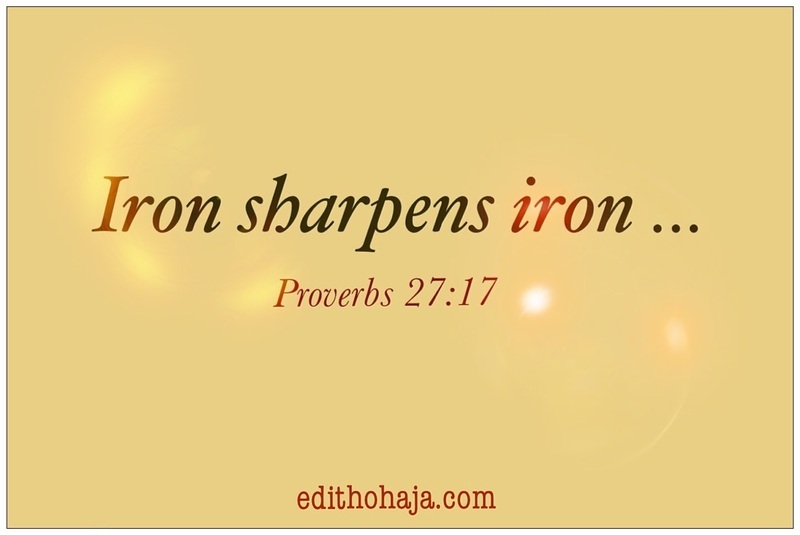 Subscribe to edithohaja.com to receive updates of new posts (inspirational, educational and entertaining articles, stories, poems, quotes and graphics) in your mail. Subscription is free. 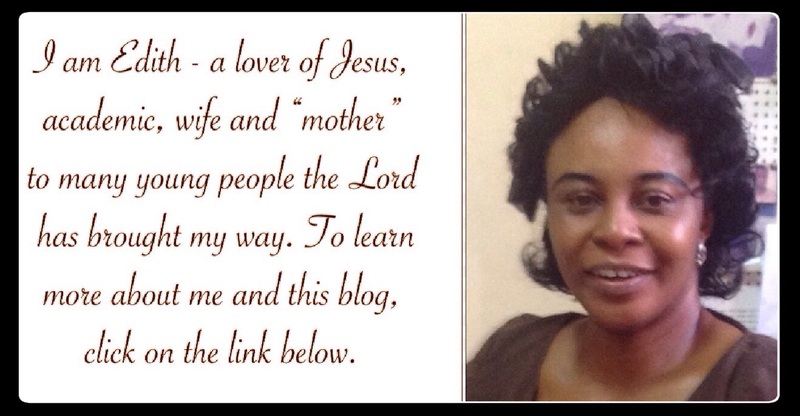 If you ever feel down or burdened, I’d like you to vist my second blog, Aunty Edith’s Blog (An Encouragement Café). Come, eat and drink from the word of God for free. The posts are crisp, refreshing and uplifting and I believe God will restore hope and joy to you through them. You can also like my Facebook page, Aunty Edith, follow me on Instagram, Twitter (1), Twitter (2) and Pinterest. Plus, you can connect with me on LinkedIn. Jesus is Lord! Really, birds of a feather indeed. Nice post, Aunty Edith. True. May God help us to divest ourselves of pride so we can serve Him acceptably in Jesus' name. it is really the problem we are having today in our denominations as some persons have made themselves the almighty dictators of the church as a result of their contributions to the church and the seed envelopes to the pastors whom a times keep their mouth shut when they ought to speak against the evil of this men in the church. I pray God will help us. that's a nice one mum. keep doing the greatest work INVESTING IN HUMANITY. He's not even the only one trapped in such politician mentality. They're like sand in the church. But I think the best thing to do is to labour as unto God, not man. when we give we receive bountifully I love this story tanks and God bless. An interesting story and very educative to all. I pray that God will always help us to do what is right all the time. Amen and may He bless you too! pride is very dangerous and is unfortunate that some people are not aware while some people enjoy pride as a leader even in the house of God. Akachi did well to visit and correct his member of his wrong attitude,people should learn to say the truth in love. the deacon also told Akachi of his weakness which Akachi himself acknowledged and thought of change. that is the problem we have with people and religion. pride and ego are really killing people. they donate in church just to be praised for their generosity. pls let's all do things for God and not for our pastor or the praise people will give us. Thank u ma, u always say the truth. I love u so much. Love you back, my dear! The Bible says that the heart of man is deceitful and desperately wicked. Our motives for doings are often impure. We need to constantly ask God to cleanse our hearts and help us to think holy thoughts like Him. True Story, so many Christians are like Dat. MR ALLWELL the protagonist of the story is a believer who is fulfilling the scriptures in the book of Mark that says “it is difficult for a rich man to enter the kingdom of God”. He knows the truth but pride will not let him please God. Akachi is a sensitive Christian, he took correction from the insult Mr Allwell threw him instead of getting angry. It's really a wonderful story. This is great. There are a lot of people in church today like Allwell who like their own opinion to be considered.people, who don't accept their mistakes even when they know that they are wrong. We should learn to give, without having anything in mind. Which boils down to #cheerful giving# unlike Allwell who gives because he wants to be respected nd given titles in church. Which is a poor orientation of giving. If God should give back the way we are giving to him.....hmmmm man no go survive ooo. Thank God for the passage that said if God should mark our guilt, who will stand.....I tank u ma for these words of encouragement. Akachi did the right thing by dropping over at Allwell's house to tell him the truth as it is; many people in churches today donate effortlessly to their own glory and not of God. Politics is in church same way it is in the world; I've been in a position of criticism over a mare church dance group and till today that group have closed up, because of the bad vices of people. Truth be told impress nobody but your God in heaven and not man; even with the little you have. Yes, they will say you're greedy and a miser, judgement is for God alone and not man, your reward is at the end, in heaven. This is indeed an inspiring piece. Yes truly there are friends who care & they say things as it is without twisting it. I haven't had much of friends but truly I can tell when I see one. Thanks aunty Edith. Allwell's position and motive/reason for donation in church are seen in the world of today, people who donate for their own appraisal, to be noticed by the pastor, clergy men & the congregation. And if in anyway the pastor or any member talks or corrects them they feel insulted forgetting that everybody in church has equal rights and no one has immunity over others "in the presence of God their is liberty". Akachi did well by stopping by at Allwell's house to mediate neutrally over the issue & not to side for anybody because of friendship or to obtain favour from his friend. Thank you ma for this inspiring piece. i don't really know if some people still understand the real meaning of giving. there are people who give in the church just for people to know that they have given and they will be hailed. WAW O! he is a good giver. indeed we still have people like that and if you have and don't give its better to start learning how to give. Another thing, as a person inspite our position we should not let our Ego over ride our sense of reasoning and doing things. This is what happens when our top pastors and bishops have turned the church into recognition of the highest bidder. Every Sunday, money talks echoing all in the name of public launching and giving too much attention to those that give big money thereby avoiding those that really gave the little they had from their heart. Personally, am not against giving God, I'm a believer in God loves a cheerful giver but am against the measures or ways in which today's church do it. I feel like this public church launching has deceived many into thinking they have become a god. Because they gave so and so amount to the church and have become popular for that, so, therefore, they have a say and things should be done exactly the way they said. Allwell should not be the only one judged but the church should, this is because they contributed to Allwells Ego. The church needs to take back its rightful position of God been the foundation of decision-making and not the highest bidder. I must commend Akachi for his boldness, for the courage to speak up to Alwell without fearing whatever thing that comes up. A lot of people in our church today is just like Alwell who gives and waits for something even bigger than what he gave out and that is not 'true christianity' neither does it imply 'cheerful giving'. Nice one ma! Before giving let's have a positive mindset towards giving if not we receive no reward. It's so unfortunate that this is what we see in today's churches. Akachi is a true friend of Allwell, cos he never supported his actions. This is exactly what is happening in today's churches. people are now giving money not that they want to give God but because they want the church congregation to recognize and respect them in the church. thank God Akachi told Allwell the truth and at the same time, Allwell told Akachio the truth. Oh dear. Our personality trying to override the mission of Christ could be dangerous. It's arrogance and pride. However, let's give for the sake of God's love and nothing more. Yes actually I have one or two friends who most times tell me the bitter truth. And honestly, it has helped me a great deal and fashioned me into becoming a better person. Truth be told, ones motivation for giving shouldn't be to receive a kind of acknowledgement or earthly reward and one should also learn to be generous when giving. Remember, God loves a cheerful giver, do not give to be seen or give grudgingly, give with love and God will bless you. Some people give offerings and sowing of seeds today in churches for show of affluence and not for the benefit that comes from God but for the mere praises that come from men. Also this mindset that we have about using our offering to enrich men of God rather than for the expansion of God's kingdom should be changed. The Bible clearly states that he that does bountifully shall reap bountifully and he that sow sparingly also shall reap sparingly. Also we shouldn't take because of our social class and be arrogant towards the house of God. Yes... I do have a friend who doesn't give a damn talking to me about my flaws. He can go ahead to tell me to hate him or seize being his friend after that. This nature of his has actually rubbed off on me cos I can now do the same even to him and others. Akachi knew his flaws and that of his friend, Allwell, he didn't classify himself as better, rather went ahead to tell how bad those actions were. Giving is living and understanding this concept brings a person to relating well with both God and fellow humans... Educating piece MA. Funny and educating story... Nowadays some Christians believe that the more you give the better your chances of being a leader in the church. I wonder what our churches are turning into. God save us. This story portrays what happens in church. Why not give you most fattening offering to God?. We steal God without knowing, by not paying our tithes and bountiful offerings. We bear grudges against our fellow worker in the church. We should learn to desist from all these bad attitude to avoid the wrath of God. I love this story ma!